Astronomers have discovered a large concentration of water vapor in a cloud of interstellar gas near the Orion nebula, 1,500 light-years from Earth, a finding that may provide an important clue to the origin of water in the solar system. The discovery was made by a team of U.S. astronomers using a satellite launched and operated by the European Space Agency, with the participation of NASA. They found that the concentration of water vapor measured in Orion is 20 times larger than that measured previously in other interstellar gas clouds. The total amount of water detected would fill all of Earth's oceans about 1 million times. Moreover, scientists suspect that the cloud may contain 50 times more water than the amount actually detected, said astrophysicist David Neufeld, a professor in the Johns Hopkins University Department of Physics and Astronomy and a member of the team reporting the finding. The discovery will be detailed in an article to be published on April 20 in the Astrophysical Journal Letters. The astronomers observed water vapor within the Orion Molecular Cloud, a giant interstellar gas cloud composed primarily of hydrogen molecules, using the European Space Agency's Infrared Space Observatory satellite, which was launched in November 1995. The new observations were carried out in October 1997 with the Long Wavelength Spectrometer, one of four instruments on board ISO. Looking in the far-infrared region of the electromagnetic spectrum, the astronomers observed the characteristic signature of emission by water vapor. "We observed a high concentration of water near the birthplace of a newly formed star in Orion," Neufeld said. "As new stars are born, material is thrown out at high speed into the parent interstellar cloud, creating shock waves that heat and compress the gas. "The warm water vapor that we observed is produced behind those shock waves." Astronomers believe that shock waves may be a cause as well as the result of star birth. "In the future, they may also trigger the formation of additional stars and planets as they compress the gas cloud that we observed, but only if surplus heat can be radiated away," said Martin Harwit, a professor at Cornell University who is an ISO mission scientist and lead author on the paper that reported the discovery. "Even though the interstellar gas is composed primarily of hydrogen molecules, water vapor is a particularly efficient radiator at far-infrared wavelengths and plays a critical role in cooling the gas and facilitating the star formation process," Harwit said. "Because the Earth's own wet atmosphere is completely opaque at the wavelengths of interest, the observations that we are reporting today are possible only from space with the use of the ISO satellite." The concentration of water vapor measured by the U.S. team was roughly one part in 2,000 by volume, some 20 times larger than that measured previously in other interstellar gas clouds. "An enhanced concentration of water is precisely what we expected in this gas cloud," said team member Gary Melnick, of the Harvard-Smithsonian Center for Astrophysics. "We are looking at a region of interstellar space where shock waves have made the gas abnormally warm. For the past 25 years, astrophysicists have been predicting that whenever the temperature exceeds about 200 degrees Fahrenheit, chemical reactions will convert most of the oxygen atoms in the interstellar gas into water. And that's exactly what we've observed in Orion." Melnick added that the strength of the water radiation detected from Orion was in perfect agreement with theoretical predictions published in the Ph.D. thesis of team member Michael Kaufman, a former Johns Hopkins graduate student now at NASA's Ames Research Center. The high concentration of water measured in Orion also may have implications for the origin of water in the solar system. "The interstellar gas cloud that we observed in Orion seems to be a huge chemical factory, generating enough water molecules in a single day to fill the Earth's oceans sixty times over," said Neufeld. "Eventually that water vapor will cool and freeze, turning into small solid particles of ice. Similar ice particles were presumably present within the gas cloud from which the solar system originally formed: it seems quite plausible that much of the water in the solar system was originally produced in a giant water vapor factory like the one we have observed in Orion." 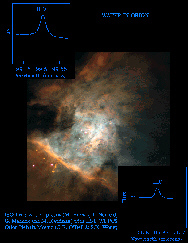 (Note: An image of the signature of water and an image of the Orion nebula can be viewed and downloaded at the following Internet site: http://www.pha.jhu.edu/~neufeld/orionwater.html).